How do I sign up for Camp Tanager? Visit the Camp Tanager website to view upcoming camp sessions. Parents or guardians can create an online account to register their child for camp online. For more information regarding eligibility and payment, or for any questions related to our camp and staff, please email campmail@tanagerplace.org. Children of all backgrounds can benefit from a positive camp experience. Established in 1926 Camp Tanager offers over 500 free camp scholarships annually for our Sleep Away Camp to kids in the community that would otherwise be unable to afford a camp experience. Our Day Camp Programs meet the needs of the community by providing a wholesome camp experience where kids can make new friends and learn new skills. Each year Camp Tanager offers two special one-week medical camp programs for youth with Diabetes and Hemophilia. 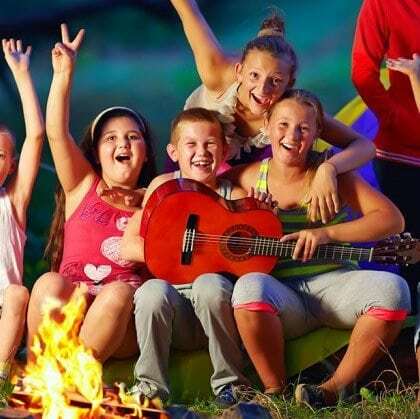 These unique programs fuse the fun of summer camp with important life changing educational programs related to each disorder. Camp Tanager is made possible by donations from our community. Since 1926, donors have helped thousands of in-need children experience the magic of camp free of charge. Camp Tanager is located four miles east of Cedar Rapids. It features an all-season facility with kitchens, meeting areas and sleeping quarters for up to 72 campers. The site features a zero-depth entry swimming pool, basketball court, sand volleyball court, baseball diamond and archery range. With nearly 24 acres of land, hiking trails and athletic fields, there’s something for everyone at Camp Tanager. Camp counselors are experienced in working with children from a variety of backgrounds and ability levels. All Camp Tanager staff are dedicated to providing a warm, nurturing and safe environment for our campers.